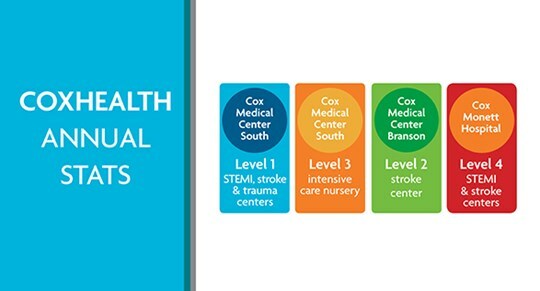 CoxHealth is a locally owned and governed health care system located in Springfield, MO. Our daily work is based on CoxHealth's commitment to professional excellence in the extended community where we live and serve. This includes six CoxHealth hospital campuses and more than 80 physician clinics offering the services of more than 150+ primary care physicians. To accomplish our goal we continue to hire quality physicians and health care professionals to achieve our vision - "To be the best for those who need us." CoxHealth is the largest employer in the region with more than 11,000 employees. As an integrated health system, it includes six hospitals with more than 1,000 beds, Oxford HealthCare, Burrell Behavioral Health, Cox Home Support and DME, Cox Ambulance and Air Care Services, and Cox Health Plans. Our health system also includes Ferrell-Duncan Clinic, a multi-specialty physician group representing 33 specialties. Benefits include excellent compensation package including sign-on bonus and paid relocation. Other benefits are advanced centralized billing service, excellent malpractice rates and favorable call coverage. Southwest Missouri is a growing region with an abundance of beauty, large lakes and outdoor activities, an academic community with more than half dozen colleges and universities, live music, theaters and major sports teams including the Springfield Cardinals. Cultural and performing arts choices include local opera, ballet and theater companies, a local art museum and a growing number of artist studios and galleries. Dining and entertainment opportunities are diverse, ranging from small downtown blues and jazz clubs to ethnic and upscale restaurants. Springfield is the third largest city in Missouri. The economy is diverse and healthy with traditionally low employment with overall cost of living and housing costs considerably below the national average. CoxHealth seeks only the best and brightest. Our physicians come from some of the finest medical schools and are committed to lifelong learning. If you are seeking a career and life that offers nothing less than excellence, consider learning more about Springfield, MO and CoxHealth.